Choosing Joy: Weight Watcher Friday-- Week 2! Weight Watcher Friday-- Week 2! I am so proud of myself this week. I have really stuck to this lifestyle change. -I managed to work out EVERY day. I have gone running the last three days and ran 5 miles! That's the most I have run at once since Hudson was born. I want to say a lot of it is because of how I have been eating. -I've had (almost) no sweets. Except on Saturday I had a mini-blizzard. I've been eating fruit and have stopped craving sugary treats. That might be a first for my whole entire life. -I have had SO much more energy. -No eating out. I did get a sparkling water at Sonic with cranberry and lime-- YUM! -Officially 3 weeks with no diet coke. I am loving Grapefruit Sparkling Water. I drink one or two cans a day and then just drink regular water the rest of the time. -I've felt more confident with myself and the healthy choices that I am making. I am proud that I am being a good example for my boys. -Anything and Everything grilled and smoked. We've been putting Bryan's new smoker to good use. We've done steaks, veggie kabobs, and grilled chicken several nights this week. -Lots of fresh berries with yogurt. 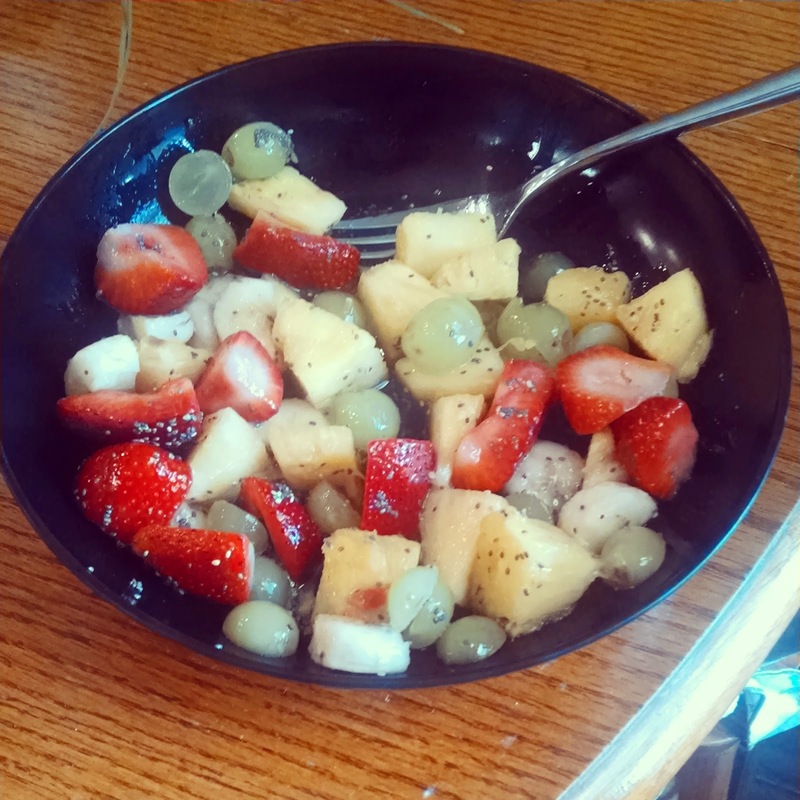 -I also made up my own recipe for fruit salad. Cut up whatever fruit you have (this is pineapple. strawberries, grapes and bananas), add 1 tbsp Agave, the juice of one lime and 1 tsp chia seeds. It is so good! GREAT JOB. How awesome. I started running 2 years ago, and it totally transformed my body. I started at ZERO, and worked my way up to ta 1/2 marathon (I ran the Chicago 10-mile race 10 months after I started running). Keep at it. Great job. Good for you, a disciplined life is the only way and sounds like you are well on your way with the running and eating. Congratulations! You don't seem like you have 60lbs total to lose. WHat are you trying to get down to? 100 lbs??? I just came across your blog and love it! I'm also doing ww, just started. I haven't posted about it yet but plan to. Your blog is encouraging. I've already lost 7 pounds on ww. Keep up the great effort- we can do this!